The corresponding author of every empirically-based publication is responsible for providing the raw data and related coding information underlying all findings reported in the paper to other competent professionals who seek to verify the substantive claims through reanalysis and who intend to use such data only for that purpose, provided that a) the confidentiality of the participants can be protected; b) legal rights concerning proprietary data do not preclude their release; and c) those requesting data agree in writing in advance that shared data are to be used only for the purpose of verifying the substantive claims through reanalysis or for some other agreed-upon use. (Policy endorsed by SPSP Board of Directors, July 2013). 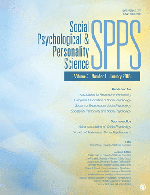 If question is raised with an SPSP journal editor (by an individual or institution (i.e., university or funding agency)) about the reliability of published findings in an SPSP journal, the editor will first evaluate whether it involves a credible question of misconduct, fabrication, or error. If editor judges that it does, the editor will refer the issue to the SPSP Publication Committee. If the concern is from an individual, the Committee will follow COPE guidelines and first contact the investigator. If the answer is satisfactory, the Committee will inform the Editor (who will inform the person who raised the concern). If an error is identified, the Committee will work with the Editor and the author(s) to publish a correction. If the author(s) do not respond or provide a satisfactory response, the Committee will contact the author(s)’ university and request an investigation. Publications should be retracted as soon as possible after the journal editor is convinced that the publication is seriously flawed and misleading (or is redundant or plagiarised). Prompt retraction should minimize the number of researchers who cite the erroneous work, act on its findings or draw incorrect conclusions, such as from ‘double counting’ redundant publications in meta-analyses or similar instances. If editors have convincing evidence that a retraction is required they should not delay retraction simply because the authors are not cooperative. However, if an allegation of misconduct related to a potential retraction results in a disciplinary hearing or institutional investigation, it is normally appropriate to wait for the outcome of this before issuing a retraction (but an expression of concern may be published to alert readers in the interim – see below). What should editors do in the face of inconclusive evidence about a publication’s reliability? If conclusive evidence about the reliability of a publication cannot be obtained (e.g. if authors produce conflicting accounts of the case, authors’ institutions refuse to investigate alleged misconduct or to release the findings of such investigations, or if investigations appear not to have been carried out fairly or are taking an unreasonably long time to reach a conclusion) editors should issue an expression of concern rather than retracting the publication immediately. If the Publication Committee does not believe that the available evidence is sufficient to make the decision, they will contact the author(s) for additional information, and/or create an ad-hoc committee of researchers from the field with specific expertise related to the issues. Because at this point in time there is no agreed upon quantitative method to unambiguously identify data manipulation or fraud, requests for retractions based solely on secondary quantitative analyses of published data will not typically be considered a sufficient basis for deciding to retract a paper. However, the Committee may issue a Statement of Institutional Concern linked to the article, noting that the institution has raised the concern based on these analyses, and also providing links to the author(s) response if available. If an Ad-Hoc committee is formed, they will be asked to make a recommendation to the Publication Committee, who will use the recommendation and/or any other additional information to make the decision whether to retract the article, issue a statement of institutional concern, or decide that there is no basis for concern. The Publication Committee will contact the institution and the author(s) to inform them of the decisions, and they will also inform the Editor and the SPSP Board of Directors.